The cemetery that I walk past daily has a tree on its fence line with lots of mulberries falling off of it. I had read a few years ago about how much the fruit stains if it falls on your car, for example, and how people find these trees to be more of a nuisance than a blessing. But there it stands, a whole tree of fruit that is just dropping to the ground and getting driven or trampled upon. Feeding the birds too. But they are not keeping up. So we had permission before we set out foraging. After the rain stopped this morning we walked to the mulberry tree. Some of the branches were even low enough for our littlest to help. The berries were good enough to eat, both boys discovered. My husband accompanied us because he thought we were going to our community garden plot. Once he found out we were going to stand by the side of the road and pick fruit off a tree that didn’t belong to us, he was not amused. But he was a good sport. In his mind, foraging is something for the down-and-outers or immigrants who don’t know better. But foraging has grown in popularity, becoming somewhat of a trendy thing to do even in urban areas. Foraging finds friends among members of Slow Food International and its regional affiliates in their effort to promote access to fresh food that is good for the planet. There’s even a site called Falling Fruit dedicated to helping people find places to forage. Created by two avid foragers, the interactive map at fallingfruit.org identifies locations around the world where fruits, vegetables and other edibles are free for the taking. Who knew? 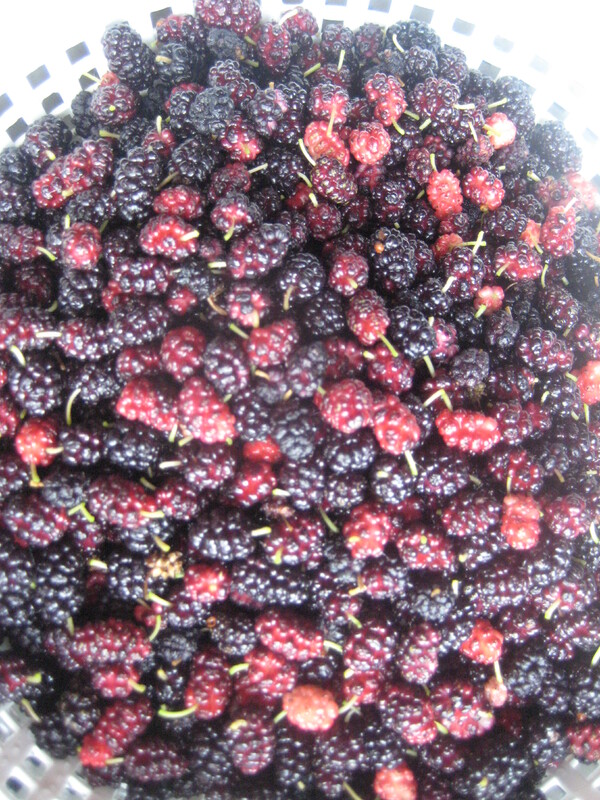 In about 30 minutes we picked what we thought would be enough mulberries for a pie and some jam. We brought them home, washed them, and measured nine cups. Then came the real time consuming part: sniping off the little green stems. My boys helped a bit but quickly grew disinterested. Now the tips of my fingers have deep purple stains, but the jam cooling on the counter looks like it’s worth it. The pie berries await baking, after the heat of the day passes. I hope the pie worked out well. I am looking forward to fresh garden produce soon. The pie filling was great. The crust was another story. I should have chilled the shortening before I started. Next time. Reminds me a bit of the blueberry picking adventure you blogged about. You know, the mulberries are still on the tree. My boys like to help themselves to a handful whenever we pass by.